As the first images of charred wreckage inside the Notre Dame cathedral appeared online Tuesday, engineers around the world said one observation was already clear: To return the ancient structure to its glorious past, builders will likely have turn to cutting-edge technology that many associate with the future. Even before engineers had been able to access the deepest corners of the still-smoldering structure, design experts, preservationists and engineers were contemplating which modern technologies might be brought to bear to restore one of Europe's most iconic structures to its fabled past. It's a speculative exercise, they admit, but one that is to be expected with the future of a UNESCO World Heritage Site at stake. The rebuilding effort will likely draw upon expertise gleaned from disasters like the Fukushima Daiichi nuclear disaster in Japan and the Brazilian National Museum fire, where experimental robots and new digital tools have been used to go places people cannot safely venture and replicate detailed artifacts lost to fire. Throughout the rebuilding effort, experts say, engineers and preservationists will be forced to wrestle with an ever-present question. "How do they meld brand new 21st century technologies with ancient craftsmanship and building trades in ways that keep the cathedral preserved and alive?" said Katherine Malon-France, the interim chief preservation officer of the National Trust for Historic Preservation, a privately funded nonprofit based in Washington. "This is going to be a very interesting intersection of technology and craft, and the world will be closely watching how they pull it off." 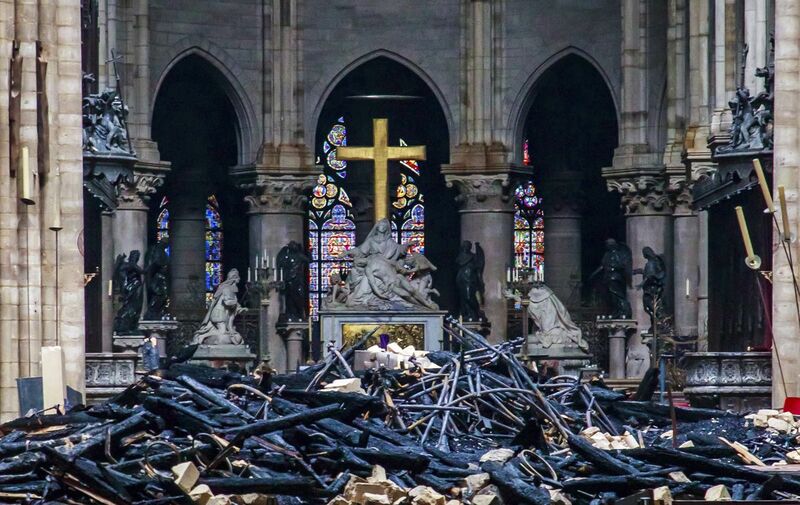 Some of the technology that will be used to restore Notre Dame has already been on display. As a wall of orange flames roared across the cathedral's roof Monday, and hundreds of firefighters mounted their counterattack, high-tech machines had already been brought to the fight. Hovering in the air above the cathedral, a pair of Chinese-manufactured commercial drones equipped with HD cameras - the Mavic Pro and Matrice M210, made by DJI - helped firefighters position their hoses to contain the blaze before it before it destroyed the cathedral’s two, iconic belfries, according to the French newspaper Le Parisien. "It is thanks to these drones, to this new technique absolutely unavoidable today, that we could make tactical choices to stop this fire at a time when it was potentially occupying the two belfries," Paris firefighters spokesman Gabriel Plus said. On the ground, Colossus, a robotic fire extinguisher, blasted the nave with water, lowering the temperature of the glass-filled room, the paper reported. In the crucial months ahead, experts say, some of that same technology will likely be used to return the 13th-century cathedral to a place that last year drew 12 million visitors. One way to start, the experts said, will be to bring in other drones to survey locations inside the vast cathedral that are too dangerous or damaged for engineers to reach. Jerry Hajjar, a civil engineering professor at Northeastern University, said drones can be equipped with sensors - such as small cameras and laser scanners - that will allow engineers to document fire damage and create highly accurate three-dimensional visions of specific locations inside the church. Hajjar said other sensors may be able to peer inside the church's walls like an X-ray and estimate the mineralogical properties and the degree of stress the structure is under. But the documentation effort could prove more difficult than it sounds, Hajjar said, noting that the higher a drone must rise, the lower its the battery life and the amount of time it can stay in the air. That could prove especially challenging, he said, in a building that reaches 226 feet off the ground. Another method for testing the cathedral's integrity could involve robots, Hajjar said, pointing out that research is already underway for using climbing robots to inspect and repair steel bridges. "The value of using robots became very apparent after the Fukushima disaster," Hajjar said. "They didn't want to send people inside because it was too dangerous, but realized they could use crawling robots to go inside the site and get valuable images." It's possible that much of the 3D mapping work engineers will be called upon to consult already exists. In 2015, Andrew Tallon, an associate professor of art at Vassar College who died last year from brain cancer, told National Geographic that he'd completed a comprehensive laser scan of the entire cathedral. Experts said Tallon's digital techniques could provide crucial information for any rebuilding effort. There's only one problem: It's not entirely clear where Tallon's scans, which could be stored on a single hard drive, are currently located, according to The Atlantic. A popular video game also could provide another source of digital information about the Notre Dame. In a 2014 article in the Verge, Caroline Miousse - an artist who worked on the video game Assassin's Creed - said she devoted two years to creating a model of the church that captured the inside and outside of the building. Once engineers have a clearer sense of the church's structural integrity, experts said, they'll be able to design a suitable roof. They'll have to decide whether to rebuild the roof framing with timber. If they don't opt for a structurally engineered wood, which could reduce the roof's weight and offer artistic freedom, engineers could choose to work with steel. Though it would depart from the church's original wooden roof, steel would allow engineers to use less material and be even lighter than wood, according to Gary Howes, COO of The Durable Group, a consortium of historic restoration companies. Replacing what was lost may not be the biggest challenge, Howes said. Instead, he said, it will be marrying the old and the new, offering the building's worldwide admirers a window in the past that includes upgrades and meets modern building codes. "This project is going to be more about emotion than structure," he said. "Everybody wants that cathedral to look like it has always looked, the way they remember it." Fortunately, Howes added, France has an advantage over the rest of the world. "Some of the best craftsmen in the world are located in France," he said. "Whether it's restoration or even contemporary work, they haven't lost the historic trades like we did here in the U.S. Each year, we go there to learn from them." James Shepherd, director of preservation and facilities at Washington National Cathedral, where damage from a 2011 earthquake is still unrepaired, said the immediate days after an event like Monday's fire will be a critical time for the Notre Dame. "They'll need expertise there to make sure that they're sorting through the rubble and pulling out things that are salvageable or not," Shepherd said. "You're talking about things that might be 700 or 800 years old that they're trying to pull out that might be partially burned or partially damaged by water." In Brazil, where fire destroyed 90% of the national museum’s collection last year, preservationists have used 3D data to re-create precious objects lost in the fire. Assuming they have access to similar data, experts said the same technique could be used in Paris.